The Tactical Medic has taken the Ryker Nylon Gear's Ankle First Aid Kit (AFAK) and stocked it with items made to help you deal with traumatic injuries. 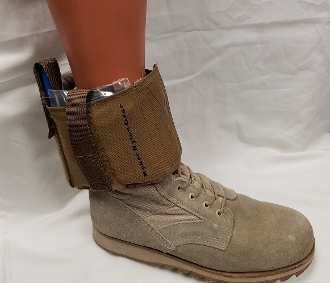 This compact trauma kit is designed to ride concealed on your ankle. It boasts 4 different pockets. There are 3 vertical and a horizontal pocket designed to carry a chest seal. The AFAK comes with an extension piece that allows it to be worn over high ankle boots or where a larger diameter is in play.